Jerry Claiborne (August 2, 1928 – September 24, 2000) was an American football player and coach. He served as the head football coach at Virginia Tech (1961–1970), the University of Maryland (1972–1981), and his alma mater, the University of Kentucky (1982–1989), compiling a career college football record of 179–122–8. Claiborne was inducted into the College Football Hall of Fame as a coach in 1999. Claiborne attended the Hopkinsville High School and the University of Kentucky and was named the College of Education's Outstanding Senior. Claiborne played halfback under legendary coach Paul "Bear" Bryant at the University of Kentucky. In 1950 he became the head football and basketball coach at Augusta Military Academy in Fort Defiance, Augusta County, Virginia. His teams won the Virginia State basketball championship in 1950 and the football championship in 1951. The following year he left to become Bryant's assistant coach at Kentucky, following Bryant in the same capacity to Texas A&M and Alabama before he moved up to become a head coach. Claiborne was head coach for the Virginia Polytechnic Institute from 1961 to 1970 with an overall record of 69–32–2. Claiborne's legacy was carried on by Frank Beamer, who played for Claiborne at Virginia Tech. Beamer built the program into a powerhouse in the mid-1990s. When Claiborne began coaching at the University of Maryland, the Terrapins had only won nine games in the previous five years. Claiborne led Maryland to a winning season after only his second year with the team. He coached Maryland for ten years and ended with a 77–37–3 record, including an undefeated regular season in 1976, before losing to Houston in the Cotton Bowl Classic. Beginning in 1973, his teams made it to six consecutive bowl games. In 1980, he added one more bowl appearance for a total of seven. Under Claiborne, Maryland won the ACC Championship three times (1974, 1975, and 1976). After the 1981 season at Maryland, Claiborne followed in the footsteps of Bear Bryant and went from College Park, Maryland, to Lexington, Kentucky; the home of the University of Kentucky. In Claiborne's case, Kentucky was his alma mater. UK had just come off four straight losing seasons. They offered Claiborne the head coaching position largely to help clean up a program that had been racked by numerous recruiting violations during the tenure of previous head coach Fran Curci. Claiborne took over as head coach of Kentucky in 1982. After starting with a losing season record of 0–10–1, he reached bowl games in his second and third seasons, posting records of 6–5–1 in 1983 and 9–3 in 1984 after which the Wildcats finished the season ranked #19 in the final AP poll. The Wildcats win in the 1984 Hall of Fame Classic over Wisconsin would be the Wildcats' last bowl win until winning the 2006 Music City Bowl over Clemson. Claiborne was never able to put together another winning team, getting no closer than 5–5–1 in 1986. However, due in part to his role in cleaning up the program's image, he remained in the good graces of Kentucky fans. 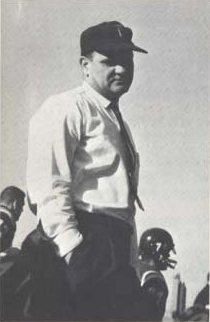 Claiborne led the Kentucky program for eight years, ending with an overall record of 41–46–3. He retired after posting a 6–5 record in the 1989 season. In 1992 Claiborne became the headcoach of the Braunschweig Lions, a then German Division II Football team in Germany. During his one-year stay he laid the foundation for an organization, that became a European football powerhouse. Claiborne coached four Academic All-Americans and eighty-seven all-conference academics. Named the nation's Coach of the Year by the Sporting News in 1974. Named Southeastern Conference Coach of the Year in 1983. Claiborne's Kentucky team won the College Football Association Academic Achievement Award for the highest graduation rate of 90% in 1989. The University of Kentucky named Claiborne into its Alumni Hall of Fame in 1992. In 1999 the Lexington, Kentucky's chapter of the National Football Foundation was named after Claiborne. Retired with a lifetime record of 179–122–8, ranking him fourth among active college coaches in victories when he retired. ↑ John David, Briley (2006). Career in Crisis: Paul "Bear" Bryant and the 1971 Season of Change. Macon, Georgia: Mercer University Press. p. 139. Retrieved January 21, 2015.